In 2016, American households headed by someone aged 32-61 averaged $120,809.40 in retirement savings, or $264,453.30 using an expansive calculation. Using the same calculations and definitions, American households have a median of $7,800 and $17,000 saved, respectively. In 2016, the Economic Policy Institute released a study with an interesting dive into American household retirement savings. Using the strict criteria of only money in liquid retirement accounts and pensions (think IRAs, 401(k)s, and current and future pensions) they zoomed in on ages 32-61. Presumably, 32 year olds should be out of any education and started saving, while 61 year olds are too young to take Social Security. Using 2013 Survey of Consumer Finances Data, they found these households saved a median of only $5,000 in retirement accounts. Our analysis extended the same strict definition to 2016 SCF data (released in 2017), finding the median household saved $7,800. We also extended the definition to include other reasonably liquid savings vehicles including stocks, bonds, and savings accounts and found a slightly more encouraging $17,000 median. (Full definitions are in the methodology section). Using these definitions, between 23% and 42% of households have no liquid savings likely dedicated to retirement. Here is how the two methodologies compare for selected percentiles. How do your own retirement savings stack up with your peers? Although we don’t have this broken out by ages (yet – stay tuned), you can compare your retirement savings to other households here. For the strict definition, only use assets in retirement accounts and pensions. In the expansive definition, use assets anywhere that you plan to dedicate to your eventual retirement. Our data comes from the 2016 Survey of Consumer Finances, and our retirement savings methodology closely hews to the EPI definitions. For the strict definition, we also use household heads age 32-61, and use the variable RETQLIQ. (It’s easiest to pull it yourself using Berkeley’s SDA Tool). In short, it includes IRAs, Keoghs, Pensions, and Thrift-type accounts (such as your 401(k) or 403(b)). For the expansive definition, we started from the umbrella category FIN, or all financial assets. From that we removed checking accounts and prepaid cards (presumably people use those to spend), as well as other miscellaneous assets. We also eliminated whole life insurance and trusts, which are generally estate planning tools. While even the expansive definition doesn’t capture all styles of retirement savings (like real estate), these numbers are still worrying. A large number of households – 42% or 23% – have zero assets in the categories likely earmarked for retirement. (Also see our net worth percentile tool or net worth by age calculator). We’ll break these numbers down further into age groups of course, but as a first cut these are concerning. 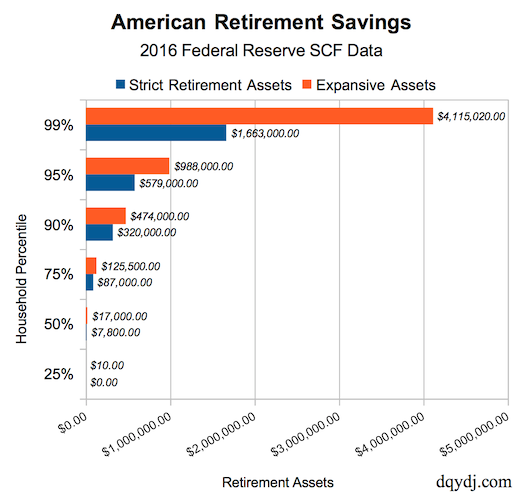 You’d have hoped to see a larger number of households with retirement savings set aside and higher total assets. In 2016 the 401(k) contribution limit was $18,000 and 57% of households in the strict set had less saved in their retirement accounts. What did you take away from this data? What’s needed to complete this retirement assessment is the median costs of living for every major group of census tracts in the U.S., and an estimate of the surplus or shortfall based on the average ages of death for men and women and retirement healthcare costs, including end-of-life care. Fundamentally, the public dataset strips geographies so we aren’t able to report out state or metro. We can do age though, watch for that soon. I think its definitely good to add the expansive assets. Usually when the media is talking about how much people have saved for retirement the figures are only money in official retirement accounts (IRA / 401k). But a lot of people have assets outside those accounts. Does any of this account for the value in defined benefit pensions? I assume its just cash value accounts. Leaving SS and public pensions out is significant. SS is a huge part of peoples retirement. Large % of pensions now are public. Sad part is without people knowing how important it is to a majority of the country, I am afraid SSI will continue to be under appreciated, and perhaps under-funded, until it is too late to save it for future generations. 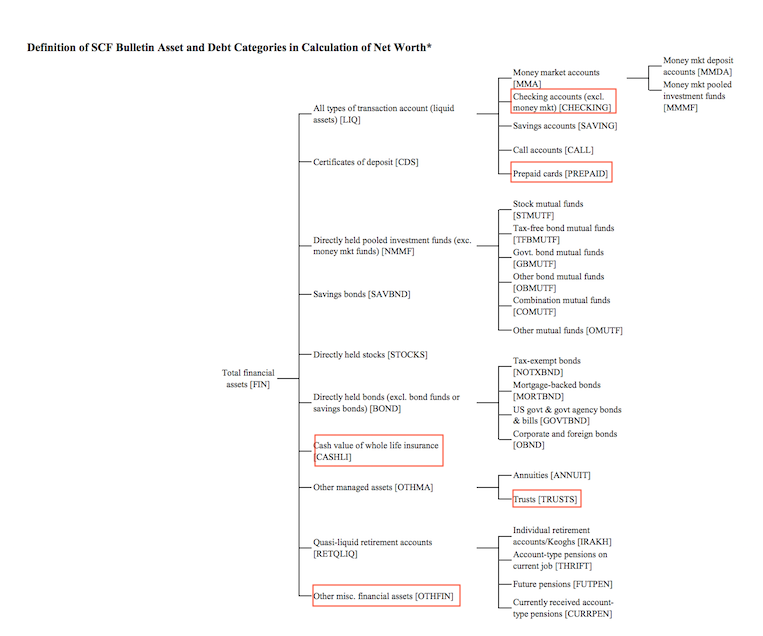 We’re only in the ‘FIN’ branch, just leaving out the categories I highlighted above. would expanding the age above 61 increase or decrease these figures I wonder? since many in their 70s and up and are actively spending these savings. Picketty’s work would lead one to believe that you would be correct on the low end of wealth (where there is virtually none) but it is exactly not the case for upper wealth percentiles. The idea that assets are built over a lifetime and are spent completely in retirement would put the asset owner at risk of running out of money too soon, so they save more and spend less in order to ensure that even if they retire 3 weeks before the next great depression, they will still be able to support their lifestyles. Without a great depression, all that safety margin is left to the estates. The retirement savings by age calculator is posted now: https://dqydj.com/retirement-savings-by-age-united-states/ . As you suspected, the amount at each percentile decreases ‘beyond’ retirement. While the data isn’t longitudinal, you can make some educated guesses from the curve.